For more information or to learn how to contribute, please contact Dr. Chris Brandl. Further advances in health care will require the training of tomorrow’s outstanding scientists. The Department of Biochemistry at the Schulich School of Medicine & Dentistry has created the Bishnu Sanwal and Theodore Lo Graduate Endowment Fund to ensure that this training will continue in order to maintain Canada’s prestigious position at the forefront of medical research. This fund was named in honour of two former Chairs of Biochemistry, in recognition of their contributions. Photos on this page are from the celebratory dinner held by the Biochemistry Dept. on 30 Oct 2015 for the naming of the fund. 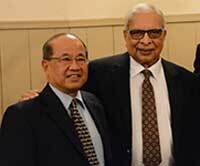 Dr. Theodore (Ted) Lo is shown on the left of the photo above, and Dr. Bishnu (Bill) Sanwal is shown on the right. Read the transcript (.PDF, 73KB) of Dr. Sanwal's speech at the dinner. Enhance recruitment of talented young researchers into graduate programs. Provide training opportunities in Biochemistry & Molecular Biology by directing research funds into graduate programs. Promote the establishment of new research initiatives with seed-funds for graduate student training. Promote communication of research findings by supporting participation at international conferences. Biochemistry & Molecular Biology are Central Disciplines in Diverse Areas of Modern Medicine. Biochemical research has prominently led the way to uncovering the molecular basis of disease and continues to provide the foremost avenue for diagnosis and treatment. Rational approaches to drug design, molecular diagnosis of disease, and the potential for gene therapy rely almost exclusively on biochemical and molecular research. Biochemical and molecular approaches led to the delineation of the human genome, which in turn has opened up many new opportunities and approaches to improve our understanding and treatment of human disease. In the post-genome era, we will witness global systems-based approaches to analyze the complex molecular inter-relationships that determine human health. Faculty in the Department of Biochemistry comprise a vibrant research community engaged in outstanding research in both independent and collaborative programs.